Break the sponge fingers or the buns into four and place in the base of a glass dish, pour on the sherry and leave the sponges to soak up the sherry. Make up the jelly using 1/2 pint of boiling water and top up with 1/2 pint of cold water (or a the juice from the tin of fruit with water to bring to 1/2 pint). Cover the sponge pieces with the fruit, in my case pieces of pineapple. When the jelly is cool pour gently over the fruit and sponge and leave to set. Meanwhile make the custard and leave it to cool. 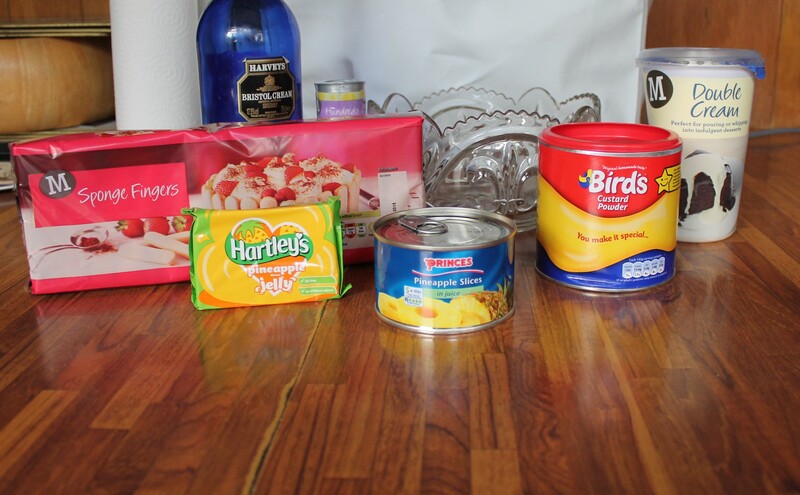 If you are making your own custard, blend the custard powder and sugar with a little milk and then add the remaining milk and microwave on full power for two mins. Stir and microwave for another two mins. Pour some cream on the top of the custard completely covering the top and leave to set. By pouring cream on top you prevent a skin forming. When the jelly is set mix the custard and cream together and pour the custard on top of the jelly. At this point you can keep the trifle in the ‘fridge for a few days. 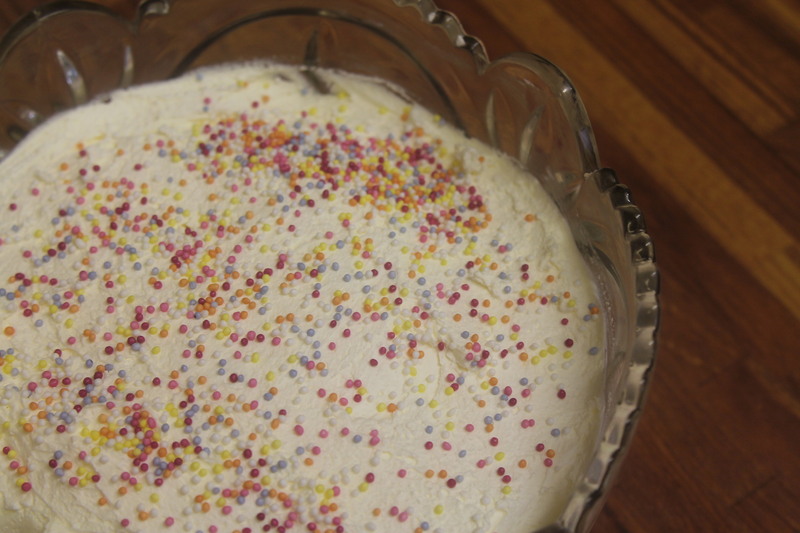 Just before you want to serve whip the double cream up and spread on top of the custard and sprinkle hundreds and thousands on the top. I would love to make a trifle someday but I don’t know if my family would eat it!